A charming bouquet of 2 dozen fresh and fragrant red roses, adorned with just a bit of greenery, is a classic I LOVE You design. Delivered in a clear glass vase, this bouquet is also a romantic standard for any day of the year. We also carry a bouquet of 3 dozen red roses. A charming bouquet of 2 dozen fresh and fragrant red roses, adorned with just a touch of greenery. This arrangement is perfect to say I LOVE YOU for an anniversaries, or just because. 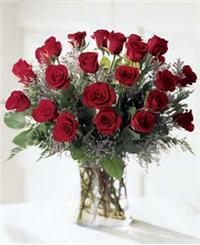 2 dozen red roses delivered in a clear glass vase, this bouquet is also a romantic standard for any day of the year. Choose Four Seasons Flowers to order red roses for delivery in San Diego!